Skyworks is pleased to introduce the SKY66105-11, a new high performance, highly integrated RF front-end module (FEM) designed for high power Industrial, Scientific and Medical (ISM) and Connected Home applications operating within the 902 to 931 MHz frequency band. This FCC-compliant module integrates harmonic filters and shielding, making it an ideal design choice for sensors, smart meters (water, gas, electric) and machine-to-machine uses. The SKY66105-11 features 30 dBm Pout which maximizes range while staying within FCC regulatory limits. The module's single-ended 50 Ohm transmit/receive interface offers a reduced bill of materials and includes fast ON/OFF time (1-2 µsec), which results in a reduction in current and enables rapid timing and multi-protocol arbitration. The RF blocks operate over a wide supply voltage range (2.0 to 4.8 V) for battery-powered applications. This device is manufactured in an industry-leading compact MCM 12-pin 8 x 6 x 1.05 mm package. 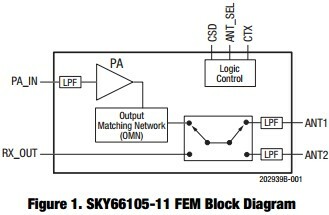 The SKY66105-11 is a high performance, highly integrated RF front-end module (FEM) designed for high power Industrial, Scientific, and Medical (ISM) applications operating in the 902 MHz to 931 MHz frequency band. The SKY66105-11 is designed for ease of use and maximum flexibility, with fully matched 50 Ω inputs and outputs, and digital controls compatible with 1.8 V to 3.6 V CMOS levels. The RF blocks operate over a wide supply voltage range from 2.0 V to 4.8 V, which allows the SKY66105-11 to be used in battery powered applications over a wide spectrum of the battery discharge curve. Skyworks Solutions, Inc. is empowering the wireless networking revolution. Our highly innovative analog semiconductors are connecting people, places and things spanning a number of new and previously unimagined applications within the automotive, broadband, cellular infrastructure, connected home, industrial, medical, military, smartphone, tablet and wearable markets. Skyworks is a global company with engineering, marketing, operations, sales and support facilities located throughout Asia, Europe and North America and is a member of the S&P 500® and Nasdaq-100® market indices (NASDAQ: SWKS). For more information, please visit Skyworks' website at: www.skyworksinc.com.